Tiberias has more than beaches or stifling summer heat. Just off Lake Galilee, there are rich archaeological remains and the graves of many famous rabbis, testifying to the city’s glory as the once capital of Jewish learning. Rather uniquely, this is an ancient city without pre-historical remains. Tiberias was planned, founded between the year 17 and 20 by Herod Antipas, the son of King Herod. Probably Antipas wanted to emulate his dad, who also had a particular fondness for creating new cities out of nothing, for instance Ceasarea. Tiberias was named after the Roman emperor, Antipas’ overlord (the Romans indirectly ruled Israel around this time). The new city replaced Sepphoris as the capital of Galilee. As the new town of Tiberias was created on the location of a cemetery, no-one was interested in living there, so people were forced to do so by Antipas. 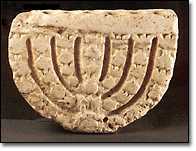 Jews soon formed the majority. The Tiberian Jews did not resist the Romans in the Jewish Wars. Because of this they were spared. After the destruction of the Temple in 70 B.C.E., Jews from the defeated Judea migrated northwards. The Galilee became thereafter the Jewish center of Israel. After the Second Jewish War, Tiberias attracted the finest Jewish scholars who made it a flowering spiritual study center. Rabbi Judah the Nasi, the compiler of the Mishna, moved to Tiberias from Sepphoris. Also the Sanhedrin moved there, the Jewish high court. Rabbi Johanan ben Nappaha, one of Nasi’s last disciples, founded the rabbinic school in 235. Ben Nappaha in his turn laid the foundations for the Jerusalem Talmud. By 535 Tiberias had been conquered by the Moslems, and continued as the capital of the northern part of Israel. It became a prosperous mixed Jewish, Moslem and Christian city. But in the 11th century disaster struck. An earthquake damaged Tiberias in 1033. Towards the end of the century the Crusaders conquered Galilee, and destroyed Tiberias. In 1998 a treasure unexpectedly turned up, which may serve as a possible illustration of the advent of the Crusaders, and shines some light on what life in Tiberias looked like at this time. 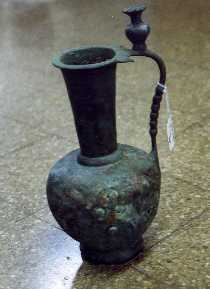 A huge metal treasure was discovered in three buried large storage jars. All in all there were 1000 rare objects; candelabras, lamp-stands, scissors, bowls with ancient Arabic writing and 58 Byzantine coins. 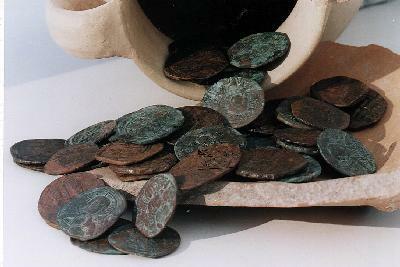 Archaeologists think the hoard may have been of an artisan who had hid his money and stock when he heard warnings about a Crusader invasion. The Crusaders did not rule Tiberias for long. They were ousted by Saladin in 1187. In the ensuing battle of Hattin, the Crusaders lost their Latin Kingdom of Jerusalem. In 1562 Suleiman the Magnificent had an idea to restore the city again to its Jewish citizens. He granted the city to Joseph ha-Nasi, a Portuguese Jew. Joseph set out to revive Tiberias by starting a silk industry, which his mother-in-law financed. He also rewalled the town. But his project failed. The city only became prominent again when a Bedouin sheik rewalled the city once more in the 18th century and singly dominated Tiberias from his private citadel - this to the fury of the ruling Ottomans. Finally el-Omar, the Bedouin, was assassinated, and his fortress crumbled down in the earthquake of 1837. This is today the location of the Donna Gracia restaurant (after the name of the mother-in-law of Joseph ha-Nasi!). Finally the city became alive again with the influx of the First Aliyah at the end of the 19th century, and Tiberias has since expanded. Visitors who are interested in Jewish graves should look up the small park between Elhadeff and Hakkam Rabbi streets. There the graves are found of Rabbi Yohanan ben Zakkai, Rabbi Eliezer ben Hyrcanus and Rabbi Moses ben Maimon (12th century), also know as the Rambam or Maimonides. A little bit higher on the hillside a white dome stands over the cave-tomb of Rabbi Akiva, who was executed by the Romans in the Second Jewish War. 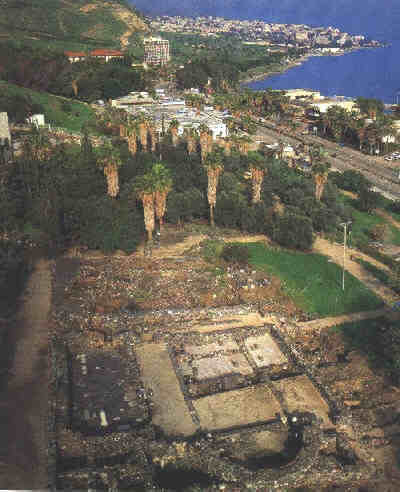 The archaeological remains of Tiberias are mainly found south of the center, near Sironit beach and Ganei Hamat Hotel. This used to be the original location of Roman and Byzantine Tiberias. Close to the beach is a square building with colonnades dating to the second century, which was built by the Romans for administrative purposes. Four centuries later it was turned into a church. About 100 meters to the south-west, there is a Roman bath-house dated to the 4th century. This was still in use after 800 years. A roof covers it to protect the coloring of the floor mosaics, which are enhanced by depictions of fowl and fish and other animals. The entrance of the bath was on the east. After entering, the guests would arrive in a hallway, then move on to two rooms in the south. The small pillars indicate the floor of the hot room. Next to the bath on the west was the main street, the Cardo Maximus, which ran through the whole city. On the east a row of shops have been excavated. These used to be very simple, only a few meters wide and without windows. They only had doors. Behind the shops a series of column bases are dug up. 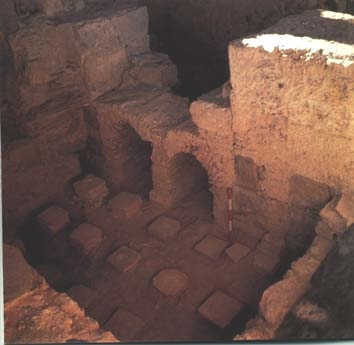 Because the western side of the street is not excavated, it is not possible to check whether there is a similar construction, with shops and square with columns. If this were to be so, it would prove the assumption of archaeologists that the whole area of the Cardo Maximus was one large covered market, which the Cardo would have cut in half. Another 100 meters or so to the south is the location of the theatre. Only the outer wall is standing, with a diameter of 70 meters. When the same direction is followed to the south, another short walk leads to the end of the Cardo Maximus southwards and ends in the old city gate. Because of its position in a wadi, its stones were silted because of the winter floods. 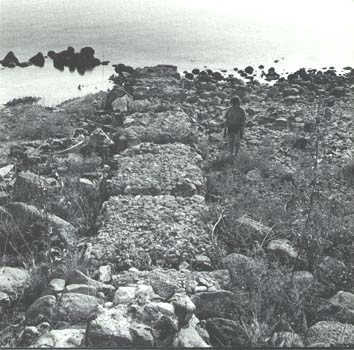 The wall led all the way eastwards to the Galilee shore. The original shape of the gate was of an arch sided with two round basalt towers (each 7 meters in diameter). When Tiberias got a new wall in the 6th century, built by the Byzantine emperor Justinian (6th century) the gate became a part of the defenses. The mountain that dominates Tiberias is called after Berenice, the great-granddaughter of King Herod. She lived in Tiberias with her brother Agrippa II, who was the governor of the Galilee. According to the Jewish historian Josephus Flavius Herod Antipas built a gold-roofed palace, but this has never been found. The ruins on the summit were duly examined by archaeologists, but they proved to have been of a church. Before the summit, under the caves, are the remains of a large public building. This is believed to be the Great Study House of Rabbi Johanan ben Nappaha, in which he and his scholars would have prepared the Gemarah, which would ultimately lead to the closing of the Jerusalem Talmud. Apart from the correct dating of the building, which was in use from the 3rd to the 8th century, nothing indicates the presence of Jewish sages. The only decorations are three squares in the white mosaic courtyard, filled with red triangles. There is also a pool opposite the double entrance to the building, with two pairs of steps. On the slope there is a theatre from the 2nd and 3rd century, and an aqueduct which led spring water from the Galilee mountains to the center of the city. On the mount itself, there is also a wall with towers, which was part of the city wall erected by emperor Justinian. The wall reached 15 meters high. As most of ancient Tiberias remains still un-excavated, already planned future digs will bring more information and understanding.